What penetrates me is the fact that art has become by degrees subjective in our hybrid-cultural society, on the other hand art makes convocations by itself. Some convocations are collected under the authority of specific notion of exhibitions, sometimes they represent by themselves on collaboration works as the artistic cooperation, in this case of convocations are connected with the unconsciousness or the primitive of each element. Therefore, collaboration work carries with it an implicit ethical orientation in relationship to differences. In 2006, Kyung sook Koo and Ian Harvey couple began to their first collaboration project during the period of the artist residency at Bemis Center for Contemporary Art in Omaha. Since then they create together under the name of Collaborations and the subject of field of life: through the human body. At the beginning of their Collaborations was composed of three monumental figures ranging from 8 feet to 11 feet, one of the work is constructed by thousands of small pieces of paintings. In 2008 they exhibited two works 9 by 11 feet per each, composed of 2112 individual abstract paintings executed on blank business cards. The figure of their work brings such kind of confused vision in which the cells, and they suggest a inter-changeability that overthrows the attempt to describe form. As a consequence, edges and forms are elusive and the figures appear to be dissolving into the ground or emerging from it. No matter of the fact that the unions of enamel, graphite and shellac, provide each unit of card with a powerful material engaging conflict between the concrete physicality of the unit and the synthetic visual fragility of the forms. Through this labor intensive method of work, Koo and Harvey are seeking for coexistence identity of their Collaborations. Therefore, their collaboration work needed a compromise on the conflicting views come form their cultural identity, it was one of the invisibilities of the difference between ego and the other. They try to discover a synthetic aesthetic on their collaboration work that exceeds the sphere of their individual artistic view points while surrounding the strength of both traditions. Taken personally their project is superficially distinct. There is solid ideological convergence, yet, in their desire to explore and understand essential parameters of identity. Kyung sook Koo, her sculptural and two-dimensional art work focuses on the body and its processed of birth and decay. By evoking the fundamental realities in which existence being and ends her work addresses the ways in which those realities provoke a constant re-evaluation of cultural identity. In contrast to her, Ian Harvey, his painting takes on aspects of identity that remain uncertain and in a state of flux. They declare the abiogenesis power of imagination and this struggles to represent the coexistence identity in response the contradiction of complex now. Here, Koo and Harvey make a plan for lecture titled Field of life, the body in contemporary Korean art. 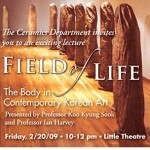 On 20th February 2009, Mendocino College Art Department invite to Koo and Harvey as speakers, this lecture is another way of representation of their collaboration work not only through the presentation of their works but also in relation with other artists and their works which explore the body as a subject. Posted by Yun In Kim	on Friday, February 20, 2009 at 13:30.